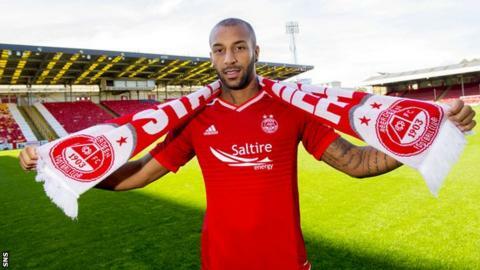 Aberdeen have signed Red Star Belgrade forward Josh Parker on loan, subject to international clearance. The 24-year-old, who captains Caribbean nation Antigua & Barbuda, will be at Pittodrie until January. After a stint in Slovenia with Domzale, Parker moved to the Serbian capital in January on a three-year deal. "He has good flexibility but he has real pace and will give us an added dimension up front," said Dons manager Derek McInnes. He's a talented player that can score goals. I feel we are getting him at a good stage in his career." Parker, who started his career at QPR, played for Red Star against Aberdeen's Europa League conquerors, Kairat Almaty, in the first round. Wycombe, Oldham and Oxford are among his former clubs. "The biggest thing about going abroad was learning a different style of football," he told RedTV. "When I was playing lower league in England, it was all long ball and 'Josh, you're not big enough to be a striker, because you're not 6ft, 2'. "I made a conscious decision to step away from it and learn a different style of play. I like to think that will benefit me here. "I have had so many ups and downs but I think this is a step in the right direction. "Obviously Red Star has the history but the way the manager spoke to me and the vibe about the club, it feels like if I can do something here it's only going to help me and the club. That's why it felt right."